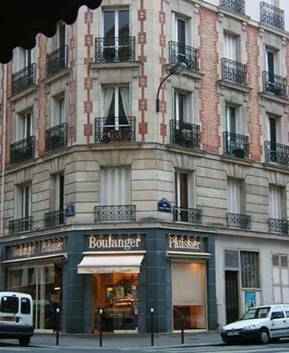 An attractive bakery on the rue de la Croix Nivert, across from Banani, a good Indian resto. This bakery stayed open until almost 9PM! 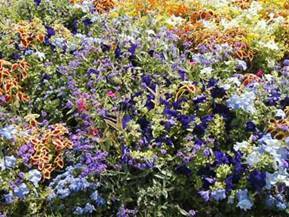 Intensely blue flowers in the Luxembourg Gardens. 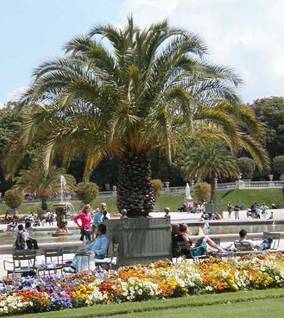 Palm tree by the lake in the Luxembourg Gardens. 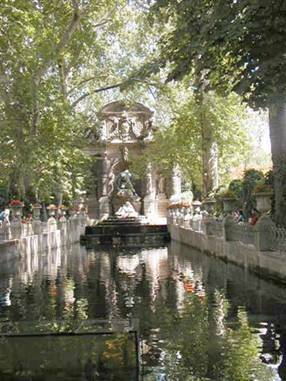 The Medici Fountain in the Luxembourg Gardens. The woman who caused the fountain to be here, Maria de Medici, only got to live in the Luxembourg Palace for a short time. Cardinal Richilieu chased her away, and back to Italy she went. The day before yesterday, we met a Romanian house painter in a park. He was a sweet guy, but quite drunk. He spoke 5 or 6 different languages, all badly. He swore that he loves America and Americans. After talking with him for 10 minutes or so, we left him there in the Square Saint Lambert and walked down the rue des Entrepreneurs to dinner at Le Tire Bouchon, which closes for vacation on Saturday. Speaking of vacation, George Bush, the man who once said the French don’t have a word for “entrepreneur,” is making the newspapers here because of the way he is going about his vacation, ignoring Cindy Sheehan, the mother of a dead American soldier. France, a country with extraordinarily strong family values, is not amused. The French media also covered the landing of the Discovery, in great detail. The French are very interested in space, and in satellites. Every day, it seems, there is at least one story in the paper concerning satellites. Today’s was about Globecast, an affiliate of France Telecom, cutting the broadcast signal for a Hezbollah Shiite Libyan TV channel from Globecast’s Hispasat and Asiasat satellites. That means no more terrorist-sympathizing broadcasts for this channel in Asia and Latin America. Hooray! The request that the signal be cut was made by the Simon-Wiesenthal Center in the U.S. Dominique de Villepan, the prime minister of France, agreed that there shall not be “la diffusion de la télévision terroriste libanise par une filiale de France Telecom.” The aristocratic Dominque just rose a notch in my estimation. People in the U.S. keep asking me if the weather has been too hot here. It has not. Every day lately, the temps have been in the 70s in Paris. The heat is in the southern part of France, in Spain, and especially in Portugal. (Poor Maria, our building’s gardienne, is on vacation in Portugal to visit her relatives.) There is a severe drought under way in western France, affecting 12 million French people. It is far worse than the drought of 1976. Even if it rains cats and dogs now, that moisture will all be soaked up by the vegetation and topsoil, and the aquifers will not be replenished anytime soon. Fish and farmers are hurting badly. Mandatory water restrictions are in effect in about a third of the country. Much of the rest of the country is under strong or limited restrictions. We are not under any restrictions yet in Paris. The latest commercial disaster to hit Europe is that it is only August, yet the annual quota for the importing of Chinese made pants and pullovers has been met. Huge orders of blue jeans, already paid for by the big stores and clothing chains like Benetton, sit in warehouses. The European Commission will not allow them to be delivered. They aren’t going to budge. The Commission says if the stores need more jeans and sweaters before the end of the year, they will have to buy them from European/Mediterranean sources. Tough! Such is life in the EU. Have you ever wondered who would be king of France if there was a king? He would be Louis Alphonse de Bourbon, a tall, dark and handsome young man who lives in Spain. Read more about him here. But alas the royalty is gone and their palace, the Luxembourg, is now home to the French Senate, and its glorious grounds, the Luxembourg Gardens, is occupied by the People. Waiter: What country do you come from? Me: My two friends here come from England, and my husband and I are from Florida. Waiter: Americans! Florida! That is where George Bush . . . .
Me: I don’t like George Bush. Waiter: I don’t either. I mean, his brother, he is, what do you call it . . . .
Me: Oh. Jeb Bush. He is governor of Florida. I don’t like him either. Waiter: Me, too. Yes, Jeb Bush! I don’t like him. (Big Smile.) What will you have? Me: Please, one Niçoise salad. Waiter, smiling: What good French you speak! Me: Thank you. And a glass of Sancerre, white, please. Woman: Madam, please, excuse me for disturbing you, but we are looking for the Bateaux Parisienne for dining. They told us to take the Grenelle bridge halfway, down the stairs to the left, and it would be there. Me (as I climb the stairs to the bridge at the end of the Allée aux Cygnes): Normally, the boat is right there (pointing to a little platform with steps down to the water). But not now. I don’t know why. Woman: Thank you, madam. Thank you very much! And thank you for your time. The woman and man descend the steps and wait by the little platform with steps. I sure hope the boat was on its way back.